It only took three volumes, but in Constantine Vol. 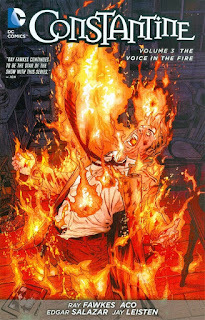 3: The Voice in the Fire, writer Ray Fawkes finally gets five issues of Constantine to tell a story uninterrupted by crossovers or the needs of other titles, and the book is better for it. Ultimately the book is neither so mature nor involved as ardent John Constantine fans might like, but there's some cogent riffs on ghost stories here and interesting crosses and double-crosses. I know Constantine is headed back to crossover-land in the next volume, but these five issues (and the Futures End tie-in issue) continue to hint at what a Constantine book might have looked like left solely to Fawkes's own devices. The high concept for Voice in the Fire is that as Constantine tries to bring down the evil Cult of the Cold Flame from within, secrets from his past are revealed. Specifically, the audience learns through a series of mystic mind-readings and ghostly projections that John Constantine's first childhood experience with magic was when another mage convinced him to cast a spell, never revealing it would cost the life of Constantine's parents. I've no idea to what extent this coincides with Constantine's Hellblazer origins, but I very much liked that here in the third volume, and in the midst of the Cold Flame story, Fawkes simultaneously steps back and shows us where Constantine came from. Admittedly, I didn't know there was a "where Constantine came from" aside from that he was just interested in magic and then hooked up with Nick Necro, so in all I found that aspect fascinating. Fawkes structures the book as a series of connected but self-contained stories, such that there's a sense of reading both a Constantine book and also a Tales from the Crypt-type horror anthology. Of these, Fawkes's best is the second chapter (issue #14), which starts from the old horror premise of a driver, Constantine, picking up a hitchhiker on the side of the road -- and Fawkes still fooled me with the hitchhiker actually being a ghost in the end. Artist Edgar Salazar's Native American ghoul here is depicted run-of-the-mill, but it's still fun to see Fawkes set Constantine in the midst of this horror trope. Also notable are the first and third chapters (issues #13 and #15); I'm sure Fawkes must have had something to do with it, but this is specifically because of artist Aco, who unfortunately departs after this volume. Aco's work is equal parts detailed, gritty, and reserved, except in the wild and weird supernatural splash pages (whereas in contrast Salazar's figures are larger and more like animation). The first issue sees Constantine fight the Spellbinder through the twisty realms of his mind; the latter has Constantine trying to escape silk tendrils of an Asian-inspired witch. I continue to believe that writer irrespective, if Aco drew every issue of this title it'd immediately leap closer to what Vertigo fans are looking for here. Again, there's a fine structure to the story, which reveals the death of Constantine's parents and then sends him on a short scavenger hunt to find out who tricked him into killing them. Unfortunately, the culprit turns out to be Tannarak, head of the Cold Flame, who was the most obvious choice anyway. As Constantine already had plenty of reasons to take down the Cult, this added motivation doesn't change the story's direction much, making it hard to figure the necessity of Voice overall. Fawkes also suggests that some of Constantine's altruism in recent comics -- perhaps as far back as the start of Justice League Dark -- might be due to Zatanna influencing Constantine's thoughts (not without troubled precedent in Zatanna's past continuities). This is interesting, and would help explain some of Constantine's recent uncharacteristic goodness, but I wish Fawkes had been more specific as to when exactly Zatanna made the switch. In all there's a general uneasiness in the book as to what's happening when, especially at the start of the issues when Constantine is suddenly hunting Spellbinder or the mage Albrecht without much explanation as to where or why. Artist Juan Ferreyra draws the Futures End issue well, including a stylized Dr. Fate helmet and a sketchy style that evokes colored pencils (no offense to the colorists, but Ferreyra's inked, slightly shaded work reproduced at the end of the book is quite striking, and I might have preferred that in the issue itself). I have to refresh my memory on New 52: Futures End, but I'm reasonably sure this issue reflects events from Futures End, whereas a good part of these tie-ins have actually been "Elseworlds" tales instead. Ray Fawkes finishes Constantine Vol. 3: The Voice in the Fire with a time-travel issue that sees Constantine in World War I, begging help from a young Dr. Occult, set against what Constantine's intended "heist" plan to finish off the Cult of Cold Flame would have been. This is, arguably, not what most people want from a Constantine book (and further, the cliffhanger that pits Constantine against Parademons), but there's a fun weird-magic craziness to it, with a touch of jazz in the heist. Again, I'd venture what true Constantine fans want is not John Constantine fighting monsters on behalf of an evil cult, but instead something more sinister and grounded; but what Fawkes contributes here is enjoyable enough at least until the relaunch.